A portrait of myself shot in the mirrored column near the playground in Fitzgerald Park, Cork. There is a place in Italy called the Tarot Garden – it is a sculpture park full of trees and sculptures like the one in FitzGerald’s Park. I have tended to stay away from self portraits… reluctant to face what I subject others too. A bit ironic perhaps. As a side note, you seem to have a nice consistent B&W treatment. Any tips? 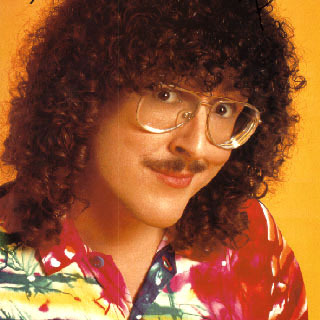 Does anybody see weird al jancovic in this photo? the precision surrounded by chaos is just delicious! what a wonderful self-portrait! Great idea and wonderful execution.